We are very fortunate in Richmond, VA. Hurricane Sandy left us relatively unscathed. She was not so kind to our friends to the north. My students often return to school after a storm or natural disaster and they cannot concentrate on the task at hand because they haven't yet worked through their feelings of fear, worry, or helplessness. I certainly can't teach fractions when the kids are afraid the roof might blow off the school! 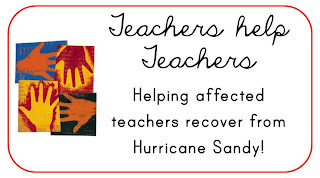 Please link up if you would like to donate to teachers who lost materials in the storm! I'm sorry that this is something you even have to discuss with your little ones. They're fortunate though to have a very caring and understanding teacher. Thank you! I'm just grateful that we were spared this time. So sorry for those who have suffered so much devastation from this storm! Thank you so much. I am back in Kindergarten after 5 years away. This storm was scary! We are in Fairfield County, CT and the damage is beyond belief. I expect we will have the whole week out! This is so perfect! I appreciate your thinking of this. I am a new fan. Check out my blog. Hope you find a fun activity. I am so sorry you have had to go through this! I hope the pack helps your kids and if you want something more or different, please let me know! I would be glad to help - you probably have a lot on your plate right now. I think this is a great idea for the students who were affected by the storm. My students were talking about the storm the last 2 days and I can only imagine what it was like for the students who had to go through this. This is great. Two years ago my school's community was hit pretty hard by tornadoes. A few students wouldn't want to go outside and play when it was a cloudy day and many would eye me nervously when it would start raining outside. Thank you for thinking of this. 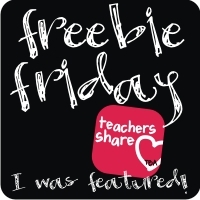 What a wonderful way to help kiddos process such an event. So very sorry that you had to experience it. Wow, Nikki. What a terrific resource for our kiddos affected by the storm. We don't really have traumatic weather in CA, but I imagine kids will be desperate to share their experience and they'll need to talk about it to manage their stress levels about it. Great idea. Thank you! !